Finally! I've been wanting to do this for the longest time, what's in my bag tag. I've seen so many bloggers/youtubers did this tag before and i really enjoy it, so i thought i'd do one myself oneday, and today is the day! Here are some of the things i've been carrying the past weeks. ♥ bag: i got this bag from one of the thrift shop in Australia around 4-5 years ago. I'm surprised by how good the quality really is, after years this bag is still in a very good condition. ♥ wallet: got this wallet from my friend, it's a local Italian brand called Marino Orlandi, good quality and affordable price. '♥ phones: i hate to admit how much i am tied to my phone. I used to use my Samsung for work/business and my Iphone6 for personal, but lately i just use my iPhone for everything because its more practical. ♥ keys & charger pouch: this pouch is one of the products of my small handmade business project. I put my house keys, cars keys, charger, and sometimes my portable charger, etc in it. ♥ make up pouch: i don't wear make up on daily basis, i usually only wear eyeliner and lipsies. I also put a small mirror, hand-sanitiser, travel-size perfume, etc, in this pretty pouch. ♥ tissue & hairbrush : Because....woman. ♥ eau de toilette: I loooooveeee this edt! Smells soooo goooood. It's Benefit, Garden of Good and Eva, i carry this everywhere! ♥ nail polish: It's in my bag because i just recently bought it. ♥ sunnies: It's always sunny here most of the time, i need this the most especially when i drive. ♥ notes and Pen: Just in case ideas come all in sudden! There you go, i've revealed everything inside my bag. What's in yours at the moment? I love the effects on your photos also! 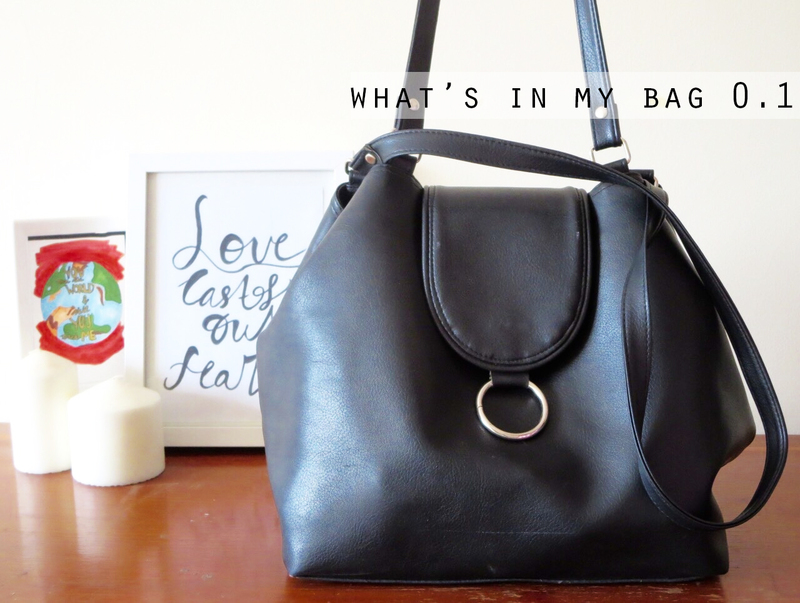 Such a fun post; I love what's in my bag posts/videos! It's so cool to see what we keep in our bags :) I hope you have a wonderful day, beauty! Your bag is very organized, mine is chaos, lol. Beautiful bag btw! I also have a lot in my purse, you are so organized in that! I like everything in your bag. Wanna be followers? Please let me know. Love posts like this. Peeking into other people's bags and seeing what their essentials are is always really interesting. 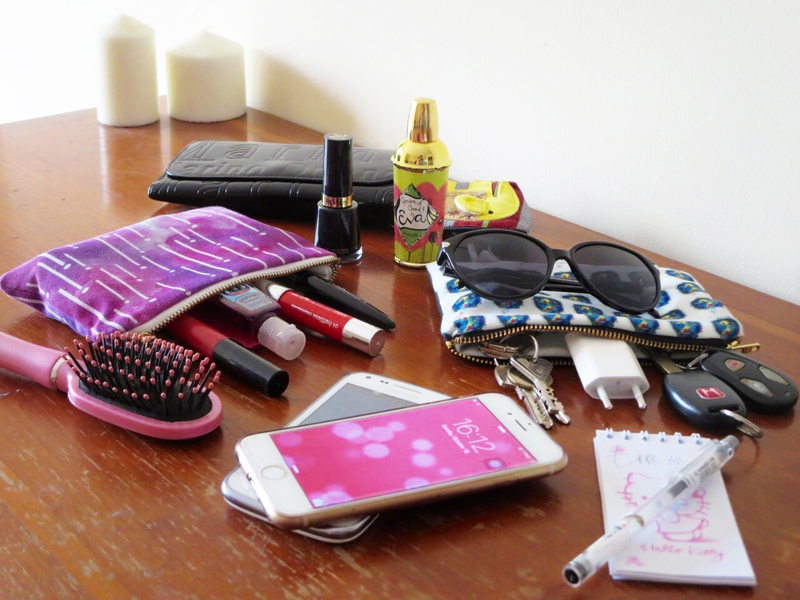 I always have my makeup pouch and and phone with me too. Should probably try to always keep my headphones with me as well as you do. It's a good idea especially for boring commutes to and from places.